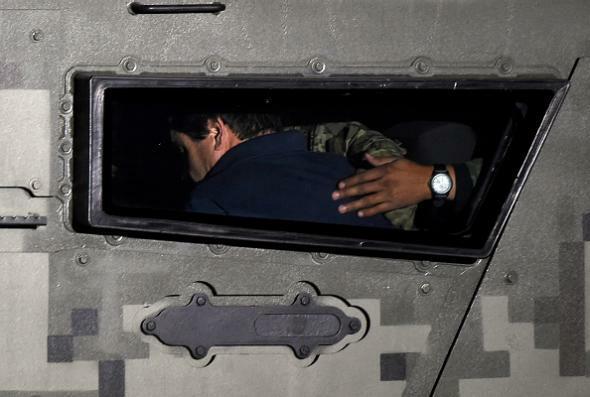 Mexico Moves to Extradite El Chapo to U.S.
Joaquín “El Chapo” Guzmán under guard at the Mexico City airport on Jan. 8, 2016. The officials, who spoke on the condition of anonymity because they were not authorized to speak publicly, said the process could take months as it goes through the judicial system. On Saturday, the attorney general of Mexico, Arely Gómez González, said for the first time that the government took preliminary steps to proceed with Mr. Guzmán’s extradition as far back as July, shortly after his escape from prison. Guzmán can challenge the Mexican government’s move and is expected to do so. He has been indicted at least seven times in U.S. federal courts on drug and murder charges. Mexico’s attorney general says Guzmán was located in part because he planned to make a biographical movie about himself and had “established communication with actors and producers.” An actress named Kate del Castillo, who had apparently been chosen as a producer, set up the October meeting between Guzmán and actor Sean Penn that Penn wrote about in a Rolling Stone story published this weekend.